Daisy Hills is the second track of the Mushroom Cup in Mario Kart 7. The track's name alludes to Princess Daisy and it is located in a village surrounded by green hills, mountains and fields with flowers, and Mountain Goats can be seen in some parts of the course. It strongly resembles an iconic Austrian landscape. Peach, gliding to land in the village. The race starts in the village. There are Miis cheering on the racers and some houses, then there is a turn to the left and the road leaves the village. There is a wooden bridge connected to a small island, then another bridge that rises and goes onto another island. This one has some trick ramps made of trunks, some Mountain Goats and a trick ramp in the middle of the grass. Then there is another bridge and another turn, which is the tallest part of the track. Then the road continues on a bridge with two boosts panels and the glider ramp. When gliding on the lake, the player must be careful to dodge the air balloons moving through it. When the player lands, there is a small fountain in the middle of the plaza that the character is able to do tricks off it and some stairs, then there is a left turn and after that the player passes through the finish line, and the second lap starts. On the first turn the player can use a Mushroom to cut through the grass. After the first two bridges there is a left turn with a ramp in the grass where the player can use a Mushroom to cross. After the third bridge there is a big left turn where the player can use 2/3 Mushrooms to cross. This leads to a small hill which goes down then up to a ramp which activates the glider. This glider shortcut makes the glider last longer. The last shortcut is on the rooftops of a village. It has two boosts then a ramp which the racer can reach optionally. If the racer decides to pass the ramp, there will be two more boosts and another ramp. Also, the player can cut through the grass, while avoiding windmills. The starting line with Lakitu and Daisy. Daisy and Donkey Kong, gliding among the balloons. Daisy, ready to land in the village. A Mountain Goat walking on the path. One of the wooden bridges. The large hill as seen from the bottom of the bridges. Peach glides over the lake. 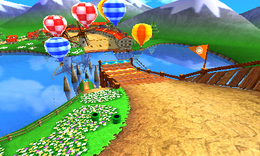 The hot air balloons, that feature on the gliding section of this course, are similar to those on the remade N64 Royal Raceway in Mario Kart 8 as they too act as gliding obstacles. This page was last edited on September 24, 2018, at 15:12.